OK, so maybe you think you already know everything there is to know about the 4 P’s — that hallmark that for many people is synonymous with marketing. But, like many things in business, the 4 P’s evolve over time and it makes sense to rethink this staple concept in a new era. Unfortunately, for most folks, marketing is only promotion — advertising and sales. So, let’s take a good look at the rest of marketing — then we’ll throw in some aspects of promotion. Product is not a “Field of Dreams” a “build it and they will come”. People buy solutions — not products. Any product that doesn’t solve a real problem or solve it better than existing products won’t survive. Probably the biggest value of social media to businesses is the access it provides into the lives and values of consumers. Used properly, these insights provide a wealth of product ideas by uncovering unmet needs. Don’t expect consumers to do your work for you — they’re not going to post something on their wall or tweet that they need X. But, they’ll talk about problems they encounter every day. For instance, consumers never asked for the mini van. It was born of observations of consumers struggling to park big vans yet needing the extra space. And, no one asked for a tablet, Apple just noticed a gap between laptops and phones. Of course, with larger screens the distinction between some phones and tablets is disappearing. Consumers have needs. Meet those needs and much of the marketing task is done for you. Fail to provide solutions to unmet needs and no amount of marketing will make you successful. Thus, marketing not only promotes existing products, but is involved in innovation. Marketing is intimately tied with not only understanding unmet needs, but representing the customer throughout the development process so the products designed not only meet consumer needs, but are intuitive and fit within existing products used by consumers. Understanding consumers is one part of the product process. Understanding competition is the other part of the product process. So often when I attend product pitches, I’m hearing about new products developed by eager entrepreneurs to take on the big boys — GrubHub, Uber, etc. Recognize, it’s VERY hard to overcome the brand equity earned by these major players over years of advertising and positive customer experiences. Even companies with some mixed customer responses are hard to battle simply because of their brand recognition. Adding a little feature just won’t cut it with these guys. I have limited space on my phone for apps and, just because your app allows the split between friends, I’ll just use Grubhub and calculate the split in my head. Instead of price, think value. Just as consumers buy products that solve problems, they buy products that offer value. They don’t care how much something costs (and they certainly don’t care how much it cost you to make the product), they only care about value. Adding more bells and whistles doesn’t create value — solving more problems or solving them more elegantly creates value. Value isn’t in direct proportion to the type of problem solved. To the right, we have Maslow’s Hierarchy of Needs. 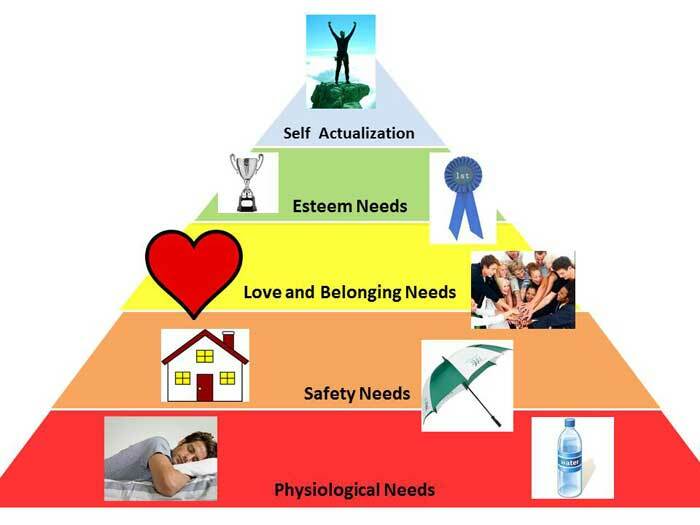 In some cases, we pay a great price for higher level needs, compared to lower level needs. But, it you’ve ever been at a football game on a hot day, you know how much a bottle of water is worth — a lot. We call this the diamond-water paradox or the value paradox. It has to do with the relative abundance of each product, rather than its importance in sustaining life. Obviously, value is subjective and different people assign different value to an object, so knowing your target audience is critical for successful pricing. In the early days of the internet, we talked about “disintermediation” meaning the place variable would disappear as companies sold their products directly to consumers via online stores. Of course, that isn’t what happened. Instead, online retailers found it difficult to attract and manage traffic to a number of pure play sites and began merging into online retailers like Amazon and eBay. And, brick and mortar retailers became savvy with online sites of their own. Big companies found channel conflict with retailers forced them to abandon dreams of selling online to end consumers or lose profitable relationships with brick and mortar retailers. Our distribution systems, or lack of distributions systems, added immensely to the cost of buying online through high shipping costs and long delivery times. Even etailers offering free shipping simply pass on shipping costs through higher product pricing. The reverse logistics necessary for product returns and product support represent nightmares for etailers and customers alike. Etailers with brick and mortar stores can offer options to buy online and pick up in store (or return through physical stores), but not every etailer has this option. Even etailers with physical stores find such options challenge inventory and accounting systems. Thus, distribution takes on an even BIGGER role post internet than it did when only physical stores made up your distribution options. Drones are one solution and Europe recently saw the first drones delivering consumer products. In the US, a drone delivered medicine to rural Virginians in the first FAA-approved use of drone delivery in that country. The future of place remains unclear. Promotion is what most folks think about when they think marketing — sales and advertising. Our previous discussion has dispelled this delusion for you, I hope. Promotion comes into play only after all the other pieces of the marketing puzzle are in place. If you’ve done a good job with the other aspects of marketing, promotion should be effective. 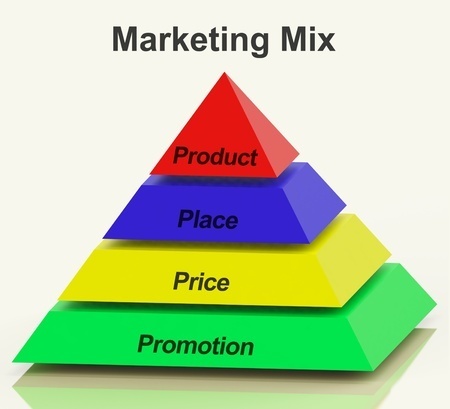 Without the other pieces, marketing won’t succeed, even with a huge promotional budget. Are the 4 P’s all there is to marketing? Of course not. The 4 P’s aren’t even the only way of looking at internal marketing, let alone all there is to internal marketing. E. Jerome McCarthy published the 7 P’s alternative to the 4 P’s in his 1960 textbook to represent a shift in marketing to include services, in addition to goods in the product category. 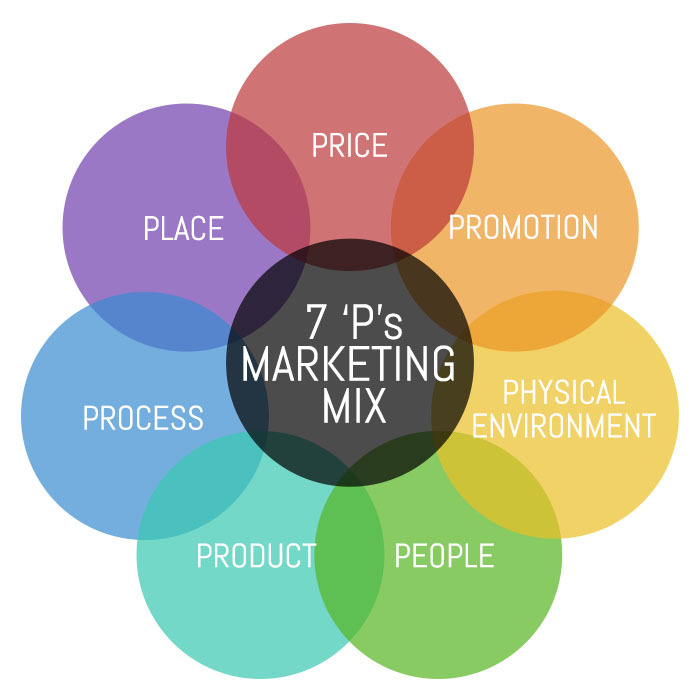 McCarthy added people, processes, and physical evidence (physical environment) to the original list of the 4 P’s of the marketing mix. People are integral for marketing in a service environment because the customer is interacting with your employees — we often call these front-line employees for that reason. A waiter in a restaurant, a clerk in a store, and a dentist all encounter their customers and they have a huge impact on customer satisfaction with the business. In this way, marketing interacts with management, especially HR (Human Resources) in terms of hiring, motivating, and rewarding front-line employees and their managers. Process represents a serious factor on customer satisfaction. Waiting for service or inept processes (like awkward return policies or slow redress for problems) create a negative impression that damages customer satisfaction and potentially increases costs. Physical evidence reflects the fact that even services have physical elements. The atmosphere of the restaurant or other retailer, the plushness of the towels in a hotel, the crowding in a theater all represent elements of physical evidence that effect customer satisfaction.